NEXT MEETING - Click here to read next meeting agenda scheduled for 4/17/2019. CALL TO ORDER - Chair Sharon Schneider called the meeting to order at 7:03 p.m. A quorum was established with 11 members present. Note: This 11-member Board requires six (6) members to establish a quorum and to take official Board action. Board Members Present - Mark Hagadone, Sharon Schneider, Marilyn Moniz, Brian Kang, Nicole Evans, Becky Gardner, Paul Hoe, Molly Pierce, Lori Yamada, David Farrell, and Calvin Hara. Board Members Absent - None. Guests - Director Mark Wong, Department of Information Technology (Mayor Kirk Caldwell's Representative), (Governor David Ige's Representative), Lieutenant G. Sunada (Honolulu Police Department); Firefighter I G. Miyashita (Honolulu Fire Department); Councilmember Ann Kobayashi and James Larson (Councilmember Ann Kobayashi's Office); Senator Les Ihara Jr.; Ian Terayama (Senator Stanley Chang's Office); Representative Calvin Say and Elton Fukumoto (Representative Calvin Say's Office); Representative Bertrand Kobayashi; Councilmember Michael Formby and Adam Doo (Councilmember Michael Formby's Office), Bryan Kimura (Hawaii Department of Transportation), Lorna Heller (Board of Water Supply); Carol Hoshiko and Louise Pagotto (Kapiolani Community College); Rae Tadaki, Sarah Chinen, Eric McCutchen, Dave Watase, Tommy Waters, Darrel Sherman, Eri Ane, and Bruce Wong (Residents); Christopher Naylon (Neighborhood Commission Office). • February 2019 Statistics: There was one (1) structure fire, one (1) wildland/brush fire, one (1) activated alarm, 81 medical emergencies, one (1) motor vehicle collision with a pedestrian, one (1) motor vehicle crash/collision, four (4) mountain rescues, and two (2) hazardous materials incidents. o Fire sprinklers respond quickly and effectively to fire, often extinguishing the fire prior to the fire department's arrival. o Fire sprinklers can save lives and property from fire. In 2014, the National Fire Protection Association (NFPA) found that sprinklers reduced fire deaths by 83%. A 2014 NFPA report found that sprinklers reduced property loss in homes by 69%. All fire sprinklers will go off at once. The truth is systems are designed so the closest sprinkler head to the fire is activated. Sprinklers cause a lot of water damage. The truth is typically, sprinklers utilize 13 to 18 gallons of water per minute. Firefighting hoses flow at least ten times that of a sprinkler. o Having fire sprinklers in your home is like having a fire fighter in your home 24 hours a day and ready to extinguish a fire. • February 2019 Statistics: There were seven (7) motor vehicle thefts, 12 burglaries, 24 thefts, 14 unauthorized entry of motor vehicles (UEMV) and 6,197 total calls for service. • Safety Tip - Emergency Vehicle Tips: The law requires motorists to make a lane change away from emergency vehicles that are stopped for an emergency, investigation of possible traffic violations rendering assistance to a police officer, or other official duties. Residents are asked to move over to the next lane or slow down below the speed limit. More information can be found at https://www.capitol.hawaii.gov/hrscurrent/Vol05_Ch0261-0319/HRS0291C/HRS_0291C-0027.htm. Questions and comments followed: Thefts: A resident asked if there was a pattern to the thefts. Lieutenant Sunada noted that patterns in thefts are related to which criminals are currently active and stated that most thefts occur during the day. A resident asked about preventative measures and Lieutenant Sunada noted that alarm systems and security animals can be effective in informing HPD of an issue. • Main Breaks: There were no main breaks to report in February 2019. • Water Rate Update: At its August 2018 meeting, the BWS Board of Directors adopted a new five-year water rate schedule. The schedule started in September 2018, but its adjustments to the rates will not become effective until Monday, July 1, 2019. The new rates will allow the BWS to continue to provide safe, dependable, and affordable water to the one (1) million people we serve on Oahu now and into the future. To inform customers about the new rate schedule, BWS will mail all customers a flyer containing information that will help explain the changes and provide examples of average bills. A copy of this flyer is being provided at Neighborhood Board meetings, and is also available online. Full details on the new rate schedule is available online at https://boardofwatersupply.com/customer-service/water-rates-and-charges. Questions and comments followed: Sewer Easements: Chinen asked about sewer easements and if residents can build upon them. Hagadone stated that an easement can be built over and noted that the area will be cleared or demolished to gain access to the easement. ANNOUNCEMENTS: There will be no candidates??? forum after the Wednesday, March 20, 2019 meeting. FILLING OF BOARD VACANCY: David Farrell filled this Vacancy during the February 2019 Meeting. • Kaimuki Christmas Parade: Hara announced that the 72nd Annual Kaimuki Christian Parade will be on Thursday, December 5, 2019. ??? Envision Kaimuki Lecture Series: Evans announced that Envision Kaimuki will be sponsoring a lecture at da Shop on Saturday, March 23, 2019 from 3:30 p.m. until 5:00 p.m. The lecture will be from Dr. John Sinton about The Geology of Kaimuki. • Citizen Forester Training: Evans announced that there will be Citizen Forester Training program that starts on Monday, April 01, 2019. The first training modules will be taught at Epiphany Church from 8:00 a.m. until 12:00 p.m. Please visit https://smarttreespacific.org/projects/citizenforester/ or email envisionkaimuki@gmail.com for more information. • Ala Wai Canal Project: Watase noted his opposition to and concerns with the United States Army Corp of Engineers' (USACE) Ala Wai Canal Project. Questions and comments followed: Puu O Kaimuki Mini Park: Hagadone asked about lights at Puu O Kaimuki Mini Park and Hara stated that he is unsure. o Green Energy Initiative: Pagotto stated that Solar Photovoltaic (PV) and Energy Battery Storage will be installed at KCC. This is part of the University of Hawaii's (UH) plan to have 100% renewable energy by 2025.
o Hawaiian Electric Company (HECO) Grids Service Program: The Grids Service program will allow for HECO to access KCC's energy storage to stabilize the regional power grid. o PV Canopies: Pagotto noted that KCC will install PV canopies within their parking lots and stated that the canopies will collect solar energy and provide shade. 1. PV Panels: Gardner asked about PV panels that are designed to resemble trees and asked for their utilization. Pagotto agreed and stated the plans were designed to integrate the panels. Watase asked if there will be glare that affects the community and Pagotto noted that PV cells are designed to absorb light. Pagotto stated that PV cells still work during overcast days. Farrell asked when the PV cells will be completed and Pagotta stated that they will be operational by Sunday, September 1, 2019. 2. Public Input: Watase asked if KCC has spoken with Open Circle and Pagotto stated that KCC has been receiving public input on the topic. Evans asked when the public comment period will end and Pagotto stated that it ends on Monday, April 8, 2019. 3. Batteries: Hagadone asked about the battery capacity and Pagotto stated that the batteries have a three (3) to five (5) hours. Hoe asked about HECO tapping into the batteries and Pagotto stated that the system is capable of outputting energy into the surrounding grid. Watase asked and Pagotto stated that the batteries are lithium. Watase asked if the batteries would be underground and Pagotto stated that they will not be. 4. Grids Service Program: Representative Say asked about the benefits of the Grids Service Program and Pagotto stated that grid stability and a 130 million dollar savings across UH campuses is the benefit of the program. 5. Safety Concerns: Representative Say asked if the PV panels are hurricane resistant and Pagotto stated that the panels can withstand winds of 130 miles per hour (MPH). Hearing no objections, Chair Schneider moved to Agenda Item: Governor David Ige's Representative. Governor David Ige's Representative: Pankaj Bhanot was present; the following report was given. • Department of Education (DOE) Lands: Bhanot noted that there will be three (3) possible locations for Act 155 lands within Kaimuki: Waialae Avenue, 22nd Avenue, and Diamond Head Road. Bhanot noted that the DOE is still deciding on the use of land and stated that the community outreach period will start in three (3) to six (6) months. Bhanot noted that any Environmental Impact Studies (EIS) would increase the timetable. Questions followed: Community Input: Chair Schneider asked about community input and Bhanot will report back. Bhanot noted that the project would take time and require the input of the community. Yamada asked that the DOE speak to the Board. Hearing no objections, Chair Schneider returned to Agenda Item: Mayor Kirk Caldwell's Representative. • Unique Crosswalk: The Department of Transportation Services (DTS) is working with community groups that have expressed interest in unique crosswalk designs. However, due to manpower and budget constraints, the City's policy is to have the community be responsible for the installation and maintenance. The DTS would consider locations that conform to the following guidelines for unique markings within crosswalks as set forth in the Manual on Uniform Traffic Control Devices: Between legally marked transverse crosswalk lines (12 inch solid) permissible as long as it does not establish the crosswalk; Acceptable colors; red, rust, brown, burgundy, clay, tan or similar earth tone equivalents; Pattern and color are to be uniform, consistent, repetitive, and not a source of distraction; No element of the aesthetic interior treatment can implement pictographs, symbols, multiple color arrangements, etc., or can otherwise attempt to communicate with any roadway user; Patterns and colors that degrade the contrast of the white transverse markings should be avoided. • Update regarding crosswalks along Waialae Avenue from Home Street Bank to Bank of Hawaii: DTS follows the guidelines set forth in the Manual on Uniform Traffic Control Devices (MUTCD), which is approved by the Federal Highway Administrator as the national standard when evaluating for traffic signals. The MUTCD provides a number of warrants with each mandating minimum vehicular/pedestrian volume requirements that must be met to justify the implementation of traffic signals. When specific intersections are brought to our attention, we evaluate the locations based on these warrants. In addition, the MUTCD provides guidelines on pavement markings for crosswalks. In reference to your request for yellow marked crosswalks, the MUTCD states, "When crosswalk lines are used, they shall consist of solid white lines that mark the crosswalk." When roadways are resurfaced, thermoplastic is now used for pavement markings. Thermoplastic has better reflective properties than paint. As such, eventually all roadways will be upgraded to thermoplastic markings. • Refuse Collection: The Department of Environmental Services (ENV) stated that a Refuse Division supervisor surveyed this location and determined there is sufficient roadway access for refuse equipment when vehicles are parked legally on both sides of street. If vehicles are parked illegally (i.e., impeding access or excessively far from the curb), residents may call 911 (police, non-emergency) for assistance. 1. Koko Head Avenue: Gardner asked about a speed bump being installed on Koko Head Avenue. Wong asked that residents post pictures of their concerns on the Honolulu 311 App to create a record of the concerns. 2. Roundabouts: Farrell asked about walking audits that found roundabouts effective in moderating speed and traffic. 3. Waialae Avenue: A resident noted people running red lights on Waialae Avenue and asked for cautionary lights to inform residents of the danger. 4. Road Signage: A resident asked that signage be installed to inform drivers of illegal right turns within Kaimuki. • Ala Wai Canal Project: Councilmember Kobayashi noted the community protest to the Ala Wai Canal Project and stated that the project does not need to be so expensive. Councilmember Kobayashi noted the community concerns about the lack of upkeep for existing retention systems in Oahu. ??? Ala Moana Park: Councilmember Kobayashi asked that the Ala Moana Beach Park continue to be kept as a park for the people. • Tree Plantings Councilmember Kobayashi noted her efforts to plant more trees within Kaimuki. • Budget Concerns: Please contact Representative Formby's Office with any budget concerns at mforby@honolulu.gov. • House Bill 85: Formby noted that special meeting that was held on Monday, March 18, 2019 and noted that House Bill 85 passed committee. Representative asked that residents submit their testimony online. • Ala Moana Beach Park: Formby noted that community input for Ala Moana Beach Park are due by Monday, March 25, 2019. • Parade and Activities Bill 8: The bill has passed transportation committee and will attempt to decrease the amount of parades that completely shut down Kalakaua Avenue on an annual basis. • Walking Audits: Representative Formby noted a Waikiki walk audit on Wednesday, April 10, 2019. To assist in the audit, please attend the Waikiki Health Center at 10:00 a.m. on the morning of the audit to participate. 1. Walking Audits: Chair Schneider asked how residents request walking audits and Formby stated that Councilmember Kobayashi and he can be contacted. 2. Bed and Breakfast (B&B): Chinen noted that the community should make the decision about B&B in their region. Formby noted that there were plans for B&B permit lotteries and detailed that concerns with that process. Chair Schneider asked how the permits would be given out and Formby noted that the Department of Planning and Permitting would need to give the City Council their regulations. 3. Garbage Pick Up Fees: Waters asked that garbage pickup fees be done away with for residents. 4. Homeowner Exceptions: Waters asked that homeowners' exceptions be raised to $200,000 to actually assist seniors. 5. Ala Moana Beach Park: Waters asked that Ala Moana remain a people's park. 6. Rail Funding: Waters asked that alternative funding methods be used for the Honolulu Rail Project. • DOE Land Use: Terayama noted the DOE's possible locations for land use projects. Questions and comments followed: Cuts to Funding: Chair Schneider asked about the UH funding cuts and Terayama will report back. A resident stated that the cuts to funding betray the purpose of UH and noted their effects. Senator Les Ihara: Senator Ihara was not present; no report was given. Speaker Emeritus Representative Calvin Say: Representative Calvin Say was present and disseminated his monthly report. 1. Line Inspectors: Chinen asked about legislature for line inspectors and Representative Say stated that he supported the State having more line inspectors and detailed how illegal renters go without being caught. 2. 16th Avenue - Harding Avenue: Representative Say noted the request to install a blinking signal to caution drivers of the region's safety concerns. 3. 14th Avenue Sewage Spill: Representative Say noted a community concern about the aging sewer systems of Oahu and stated that sewer lines are breaking due to their age. Representative Say noted that this will create an issue due to older sewer lines and easements not have proper agreements. • Fiscal Report: Representative Kobayashi noted that there will be a 250 million dollar loss in the revenue stream for Fiscal Years 2020 and 2021. ??? House Bill 1383 HD2: Kobayashi noted the attempts to create a decriminalization bill for marijuana and stated that they are attempting to limit the fines connected to the bill. Questions followed: Marijuana Byproducts: Hagadone asked about the sale of Cannabidiol (CBD) and other marijuana byproducts. Hagadone asked about the scheduling of these drugs and Representative Kobayashi stated that the bills would not have any effect on marijuana byproducts. Hearing no objections, Chair Schneider returned to Agenda Item: Senator Ihara. • Ala Wai Canal Project: Senator Ihara noted that all communities should be invested in their communities; similar to the Ala Wai residents with the Ala Wai Canal Project. 1. Ala Wai Canal Project: Farrell asked about the United States Army Corps of Engineers' (USACE) stance on the Ala Wai Canal Project and Senator Ihara stated that there will need to be a concerted effort towards garnering community input. Chinen stated that Governor Ige has approved funding for the project. Senator Ihara stated that no bills have been created to allocate funds and noted the bills in opposition. Chair Schneider asked if there will be mediation for the project stakeholders and Senator Ihara noted that there will need to be community engagement. Senator Ihara noted that the project will needs funds to find the community's thoughts on the project. Yamada asked whom had previously funded the project and Senator Ihara noted that he had voted for the project's funding. Pierce asked about a deadline for Federal funding and Senator Ihara noted that USACE may choose to use the funds on another project. Pierce asked if the Stated would fund a similar project and Senator Ihara stated that the State has not funded any flood mitigation projects in the region. Resolution in Support of Deferring Funding for the Ala Wai Canal Project - Hearing no objections, the Agenda Item was deferred until the April 2019 Meeting. Approval of Wednesday, February 20, 2019 Regular Meeting Minutes - Hearing no objections, the Agenda Item was deferred until the April 2019 Meeting. Treasurer's Report - Kang reported an expenditure of $25.68 in January 2019 and a balance of $275.32. Reports from Other Meetings: Chair Schneider and Hagadone noted their attendance at the Ala Wai Canal Project community meeting on Tuesday, March 19, 2019. A. Reminder that the Hapalua Half Marathon is scheduled for Sunday, April 4, 2019 at 6:00 a.m. For more information, please visit www.honolulumarathon.org. B. 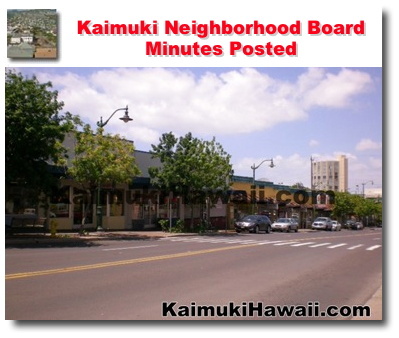 The next regular Board Meeting will be Wednesday, March 20, 2019, at Kaimuki Christian Church, Fellowship Hall, 6:30 p.m.
ADJOURNMENT - Chair Schneider adjourned the meeting at 8:43 p.m.